Trout: What's Canelo going to do when things don’t go his way on April 20th? WBA World junior middleweight champion Austin Trout (26-0, 14 KO’s) thinks his opponent WBC junior middleweight champion Saul “Canelo” Alvarez (41-0-1, 30 KO’s) won’t be able to make the right adjustments when things don’t go his way this month in their fight on April 20th at the Alamodome in San Antonio, Texas. Trout sees Canelo as being someone that has only gear and can’t adapt to different situations, especially when all of a sudden he is getting out-boxed for the first time in his career. Canelo badly wants to beat Trout because he defeated his brother Rigoberto Alvarez two years ago in winning an easy 12 round unanimous decision to capture the vacant WBA junior middleweight title in 2011. Trout says he’s not caught up in all the revenge garbage and he just wants to win the fight. It wasn’t personal for him that he easily beat Canelo’s brother. He just wanted his title. Canelo’s thing is he could end up fighting with anger instead of with his brain and that could very lead to him trying too hard to score a knockout against an opponent he’s likely going to have a lot of problems hitting cleanly with his punches. It’s going to be really interesting to see what Canelo can do if he’s unable to have a stationary target to land his big shots. He’s fought a lot of Mexican fighters that have been right in front of him so that he could land his power shots. What happens when Canelo doesn’t have that against Trout? We could see another Julio Cesar Chavez Jr. vs. Sergio Martinez fight where one fighter, Canelo, is using a fighting style out of the past against a modern day fighter in Trout. 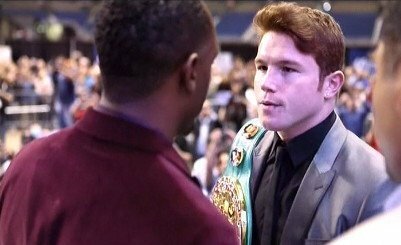 Things could go really wrong for Canelo and he might end up looking all of his 22 years in this fight. You are here: Home / Boxing News / Trout: What’s Canelo going to do when things don’t go his way on April 20th?